Who were the winners at UFC 202: Diaz vs McGregor 2? Click below to get the results for all the fights at T-Mobile Arena in Las Vegas on Saturday, August 20, 2016. 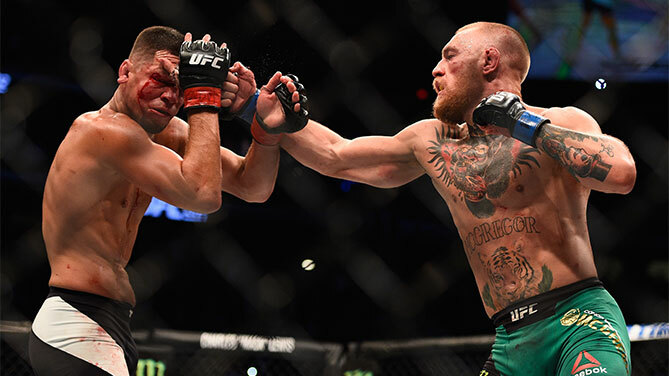 In a rematch that more than lived up to the hype and wildest expectations, Conor McGregor got his win back against Nate Diaz, outlasting the Stockton bad boy en route to a majority decision win (48-47, 47-47, 48-47). McGregor seized control in the opening rounds, landing the bigger shots and busting Diaz open by the end of 10 minutes. But the tide seemed to be turning late in the second and in the third Diaz took charge, out-landed McGregor 58-24 in the frame. But the Irishman had been there before and he survived, got back to his stool where he was laboring, breating hard. But he regrouped and came back and turned in a workmanlike effort in the fourth. The two exchanged in the fifth and Diaz landed a takedown as the final seconds ticked away to steal the fifth. One judge scored the third 10-8 for Diaz, but the other two didn’t think Diaz did enough to award the dominant number. 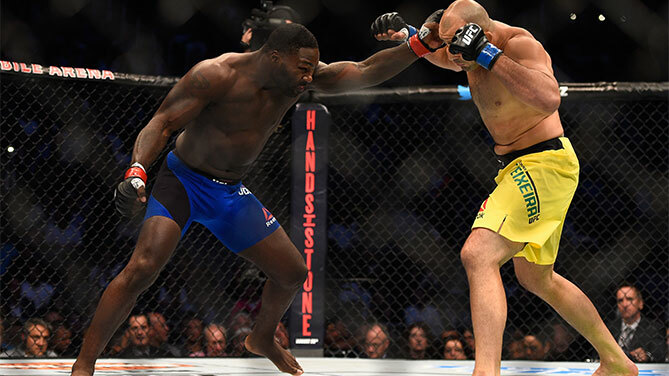 When Anthony Johnson steps into the Octagon the age-old adage of “don’t blink” almost always holds true. This time, Rumble did it in record time. Johnson landed a titanic right upper cut in the opening seconds against Glover Teixeira, knocking him out where he stood. Johnson landed a few secondary hammer fists before the referee could jump in to stop it, but that was all she wrote. 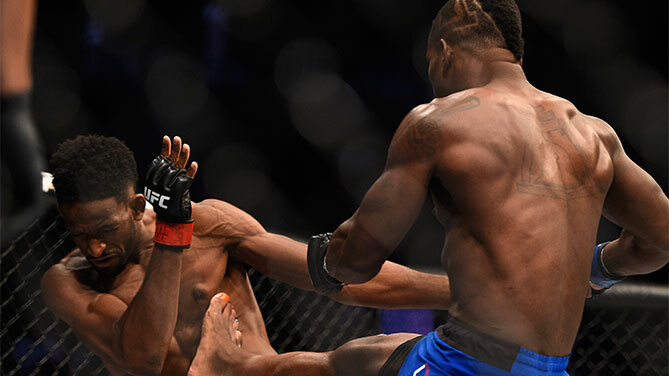 Rumble earned the knockout at just 13 seconds of the first round. Johnson told Daniel Cormier, who was sitting cageside, that he’s coming for the title. Donald “Cowboy” Cerrone remained undefeated at welterweight after picking up his third-straight finish victory, stopping Rick Story by TKO at 2:02 of the second round. 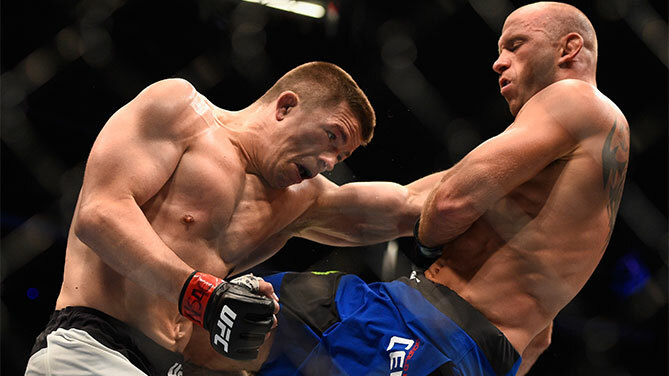 Cerrone’s speed at 170 pounds is blazing and he capitalized with a super slick combo that rocked Story before pouncing to land punches on the ground to get the stoppage. Cerrone, who holds a win over current lightweight champion Eddie Alvarez, called out the champ after the fight for a bout at Madison Square Garden later this year. 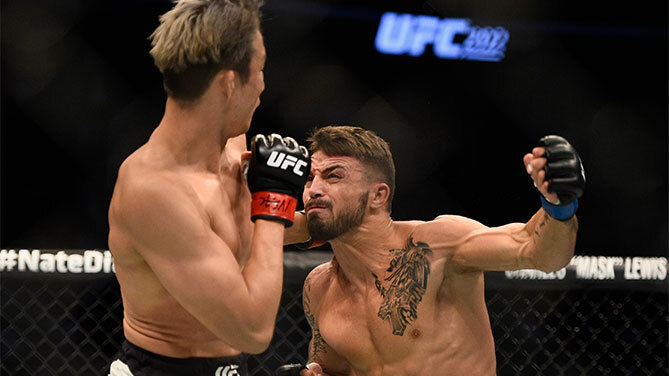 Mike Perry didn’t seem to have any Octagon jitters, as he rocked Hyun Gyu Lim several times in the first round before finishing him with an overhand right and another shot on the ground to earn the TKO stoppage at 3:38 of the first round. Perry out-struck Lim, 57-11 and 40-11 in significant strikes to cruise to the one-sided win. 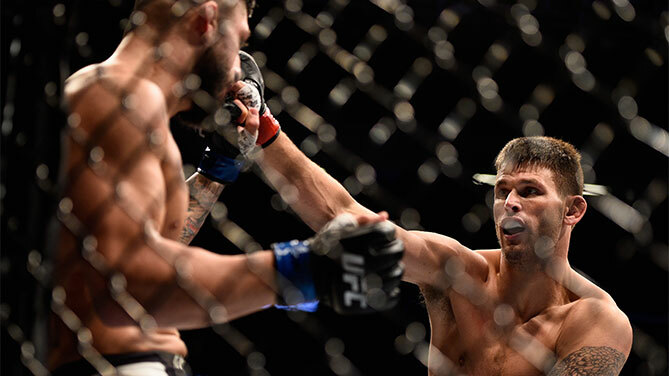 Tim Means returned with a statement win after a six-month suspension to finish Sabah Homasi by TKO at 2:54 of the second round. Means landed a pair of big elbows in the first round that opened Homasi up. As blood started to run over his eye down his face, Means turned up the volume but a tough Homasi made it through the round. But in the second round Means took it to another level and started smacking Homasi around the Octagon before the referee stepped in to stop the punishment midway through the second round. 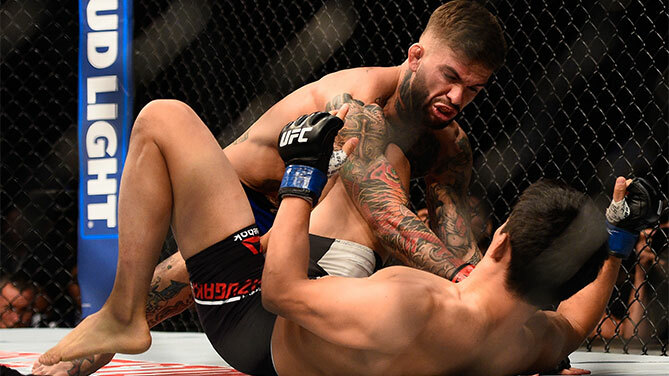 Cody Garbrandt landed a short straight right as Takeya Mizugaki was leaning away from the left and then “No Love” exploded with a barrage to a downed Mizugaki to finish the fight at :48 of the first round by TKO. As Mizugaki collapsed, Garbrandt pounced and landed a couple more for good measure before the fight was called. After the fight Garbrandt called out Dominick Cruz as he has been doing for months and Cruz seemed open to the idea from his spot on the FS1 desk in T-Mobile Arena. Garbrant has now won four in a row in the UFC bantamweight division (10-0 overall) which is good for second-best win streak in the division behind Cruz’s five. In what turned into quite a grappling contest, Rocky Pennington’s three takedowns and 33-15 advantage in significant strikes earned her the unanimous decision victory (30-27, 30-27, 30-27). 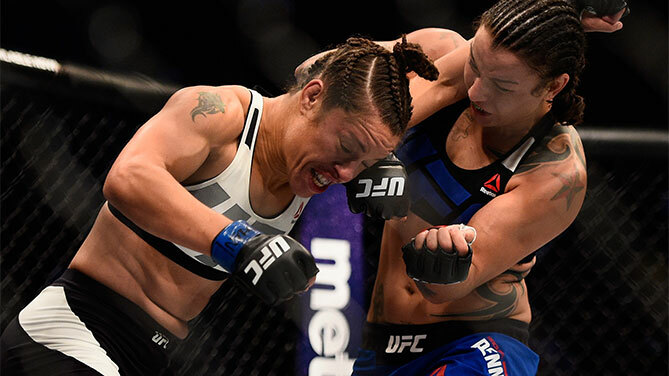 The win is the fifth of Pennington’s UFC career, which is tied for third-most in women’s bantamweight history. 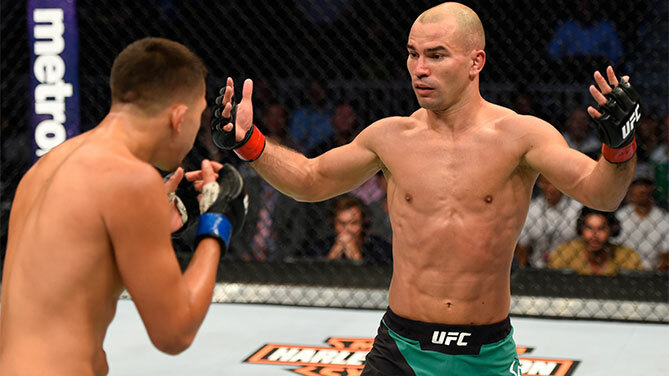 Artem Lobov zeroed in on Chris Avila’s lead leg and landed a number of huge leg kicks to force the UFC debutant to become a one-punch striker throughout the majority of the fight as he hobbled around and dealt with the damage. In the end Lobov out-landed Avila in significant strikes, 68-44 to take the unanimous decision win (30-27, 30-27, 30-27). 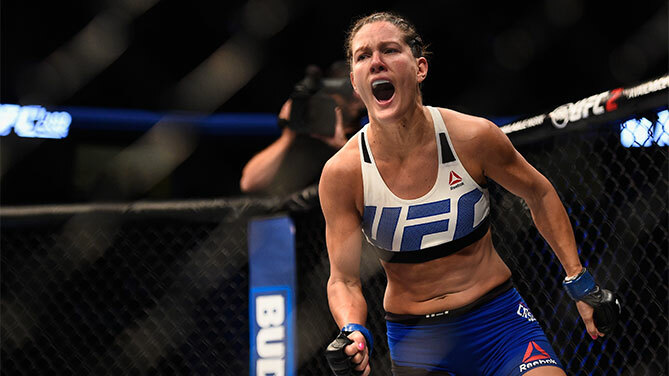 Cortney Casey picked up a neat little first-round submission against Randa Markos, dropping the former The Ultimate Fighter contestant to 2-3 in the UFC. Markos went for the head and arm throw early in the fight but lost position and had her back taken and then reversed. Casey was able to grab ahold of the arm and sink in an armbar. Markos got turned over and was forced to tap at 4:34 of the first round. Don’t have FIGHT PASS? Start your free trial now! 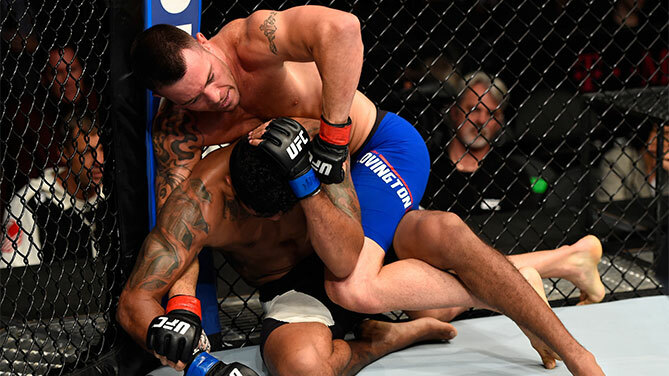 Don’t look now but Colby Covington has quietly put together a 5-1 record in the UFC with a big fat exclamation point that came Saturday night in the form of a third-round TKO win against Max Griffin. Covington put on a grappling clinic, landing six takedowns and out-striking Griffin 161-31 before the ref finally called a stop to the fight at 2:18 of the third round. Covington screamed at Griffin after the stoppage, claiming he’s the king. The two had a heated staredown at yesterday’s weigh-in and the bad blood was still boiling. 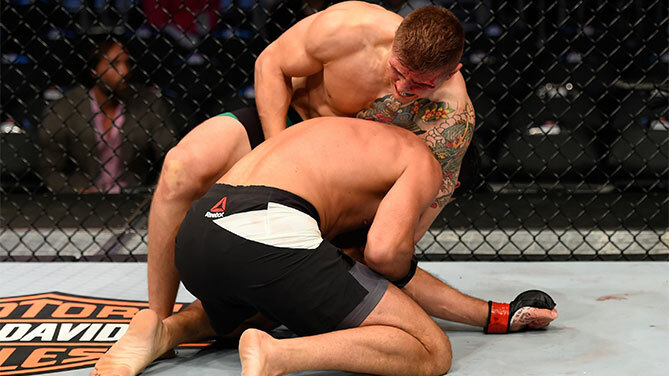 Marvin Vettori submitted Brazilian Jiu-Jitsu black belt Alberto Uda in his UFC debut to kick off the action in Las Vegas at UFC 202 on the UFC FIGHT PASS prelims. Vettori locked in a head and arm choke and forced Uda to tap at 4:30 on the very first round. Vettori’s confidence on the mat was evident from the start when he engaged a clinch early and the fight went to the ground almost immediately after that. Vettori was taken down but was able to reverse and worked from the top for a bit before eventually getting into position for the submission win.